Does the Easter Bunny at your house ever crave for those ever-present plastic eggs to have a little more oomph? The Easter Bunny here does, that's for sure. That got me thinking how much fun Shimmerz would be! 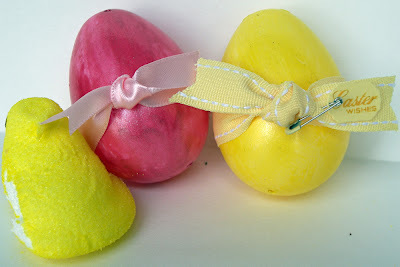 Here, I painted a yellow egg with Sunny and a pink egg with Royal Red. It's such a quick and easy craft - and I'm already thinking to next year, with a bunch of these done up for a wreath. Can't you just imagine how festive that would be? How cute are those eggs!! I wish I had small ones again to color eggs with. Anybody what to let me borrow some children? ?